Lung cancer is the most commonly diagnosed non-skin cancer in the United States. Each year, over 222,000 people are diagnosed with lung cancer, and over 150,000 succumb each year to the illness, making it also the deadliest cancer in the country. With constant advancement of treatment options, the importance of accurate diagnosis and detection of lung cancer becomes more and more relevant to the survival of the patient. 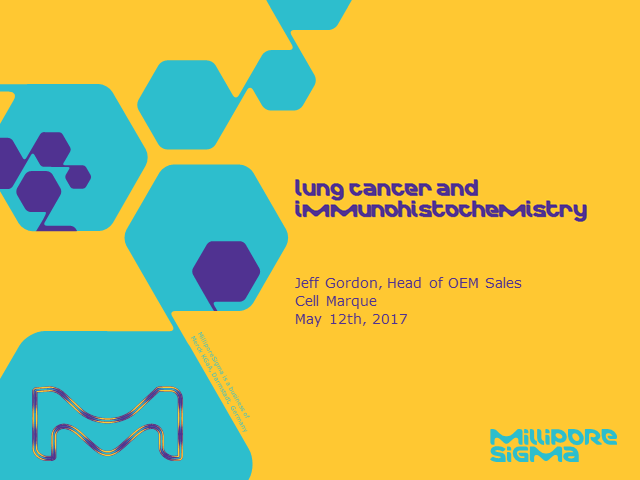 Immunohistochemistry has served as the catalyst for these advancements in lung cancer diagnosis. This presentation covers many of the basic science, facts, and statistics of lung cancer, as well as the utility of immunohistochemical testing with markers such as TTF-1, napsin A, desmoglein-3, and p40 in the accurate diagnosis and survival rates of lung cancer.